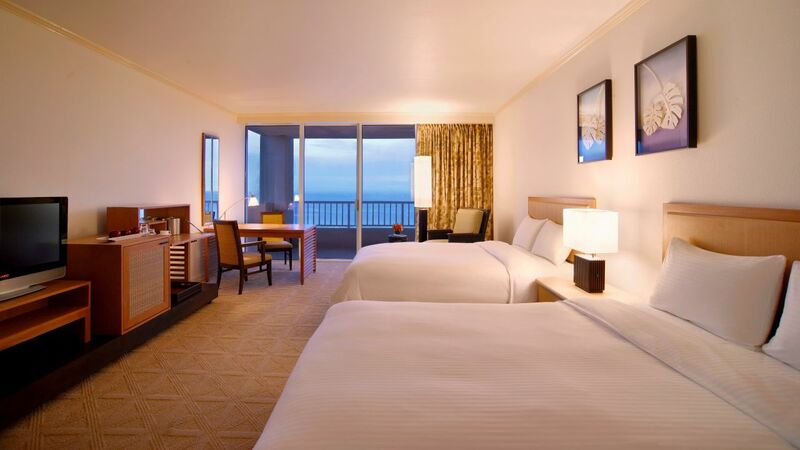 Each of our 450 guestrooms offers the relaxing view of the ocean with flat screen televisions, complimentary Internet and a work desk. 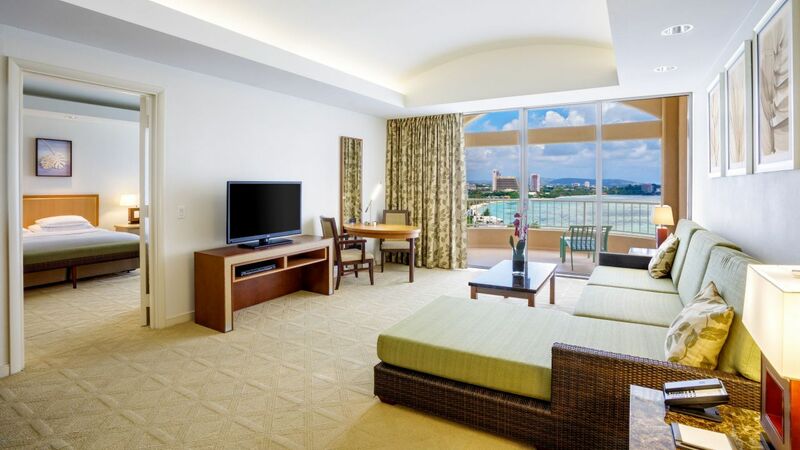 Hyatt Regency Guam’s elegant suites offer separate living rooms and bedrooms, and are distinguished by their resort décor and outstanding amenities. They offer ultimate luxury with large living spaces, wrap-around balconies and in-room jet baths. 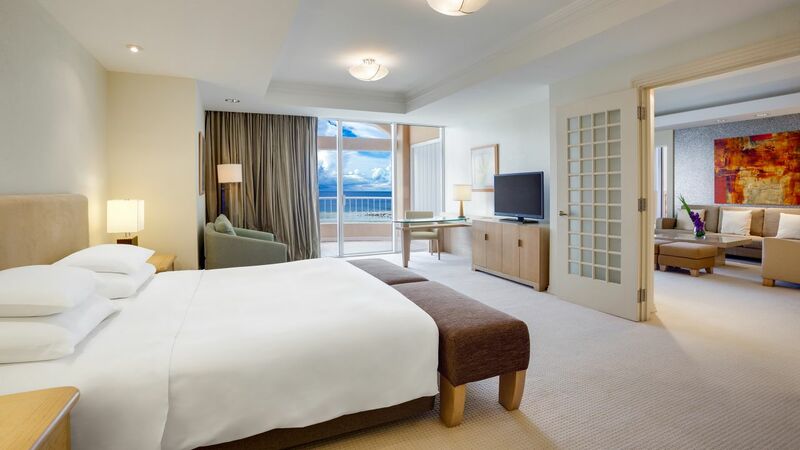 Spacious 97-sq.-metre room features a crisp, airy design complementing plush king bed with fluffy white duvet, balcony, separate work area and deluxe bath with walk-in shower and tub with ocean views. Deluxe amenities include complimentary welcome amenity, newspaper (upon request) and Regency Club lounge offering private concierge, breakfast and evening canapés and complimentary Internet access. This is a standard suite. See World of Hyatt program terms for upgrade eligibility. 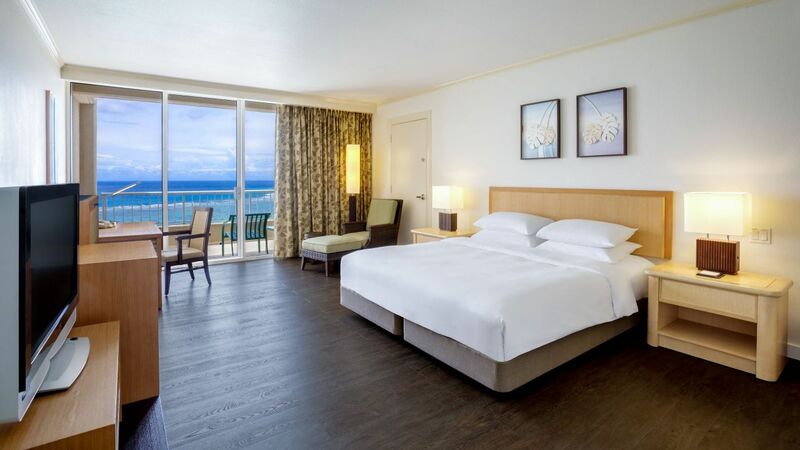 Spacious 97-sq.-metre room features a crisp, airy design complementing two plush double beds with fluffy white duvet, balcony, separate work area and deluxe bath with walk-in shower and tub with ocean views. Deluxe amenities include complimentary welcome amenity, newspaper (upon request) and Regency Club lounge offering private concierge, breakfast and evening canapés and complimentary Internet access. This is a standard suite. See World of Hyatt program terms for upgrade eligibility. Luxurious 160-sq-metre top-floor suite features an oversized balcony, living and work areas, deluxe bath with jetted spa tub and walk-in shower and bedroom featuring a plush king bed with fluffy white duvets. 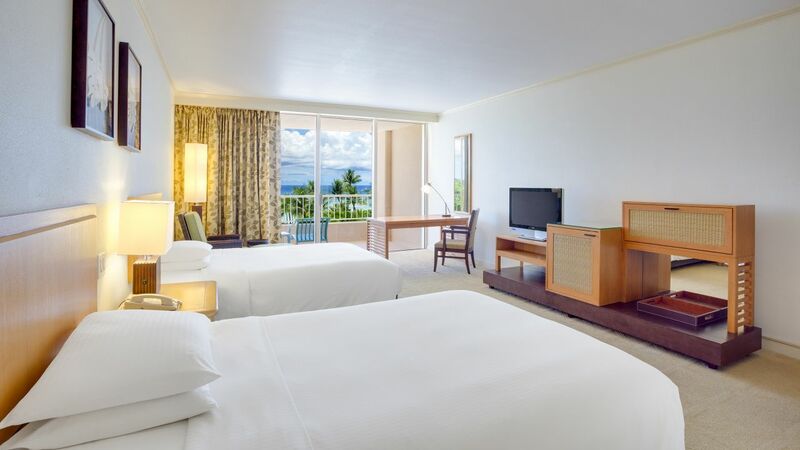 Enjoy clean, crisp decor with a tropical feel, plus amenities such as bathrobes and slippers, fruit basket and Regency Club lounge with breakfast, concierge, and high-speed Internet. This is a premium suite. See World of Hyatt program terms for upgrade eligibility. Luxurious 160-sq-metre top-floor suite features an oversized balcony, living and work areas, deluxe bath with jetted spa tub and walk-in shower and bedroom featuring two double beds with fluffy white duvets. 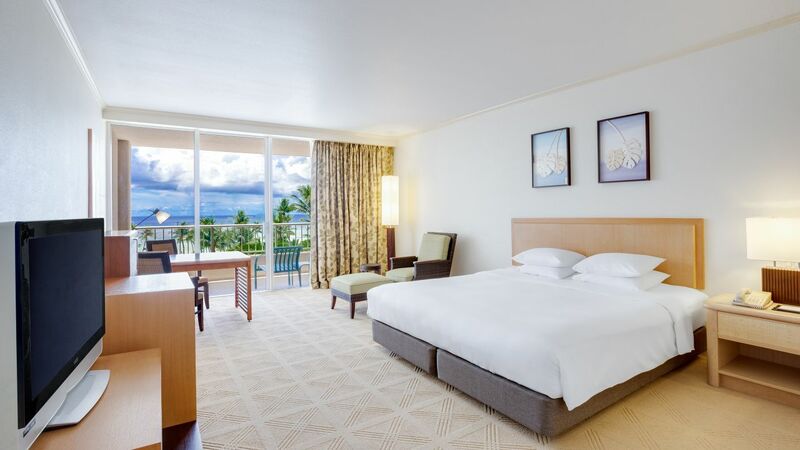 Enjoy clean, crisp decor with a tropical feel, plus amenities such as bathrobes and slippers, fruit basket and Regency Club lounge with breakfast, concierge, and high-speed Internet. This is a premium suite. See World of Hyatt program terms for upgrade eligibility. On the top floor of the hotel, a luxurious 219-sq.-metre suite features fresh, tropical decor complementing a spacious balcony, living and work areas, kitchenette, deluxe bath with jetted spa tub and walk-in shower and separate bedroom with a plush king bed. Luxurious amenities include soft bathrobes and slippers, adjacent sauna and exercise facility and Regency Club extras. This is a premium suite. See World of Hyatt program terms for upgrade eligibility. 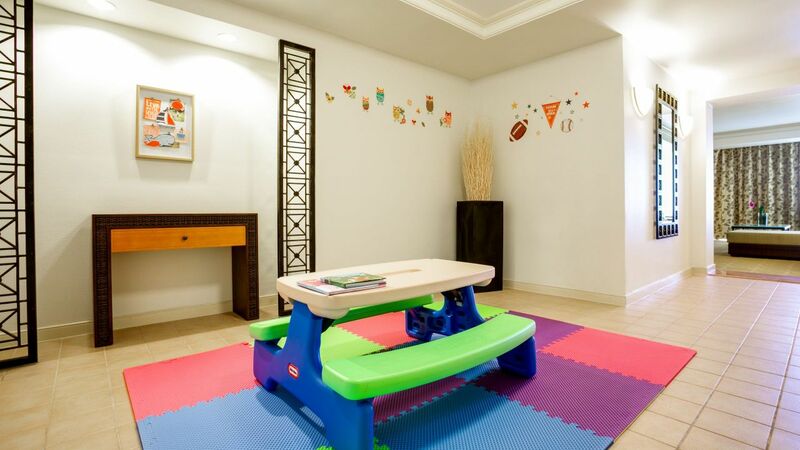 Your family will appreciate this spacious 97-sq.-metre suite featuring a separate sitting area, plush king bed with fluffy white duvet, a single bed with fun children’s bedding, glow-in-the-dark lamp, dedicated play area, baby bathroom amenities (upon request), playful décor as well as cookies and milk upon arrival. The family touches are complemented by deluxe amenities that include complimentary welcome amenity, newspaper (upon request) and Regency Club lounge offering private concierge, breakfast, evening canapés and complimentary Internet access. See World of Hyatt program terms for upgrade eligibility. 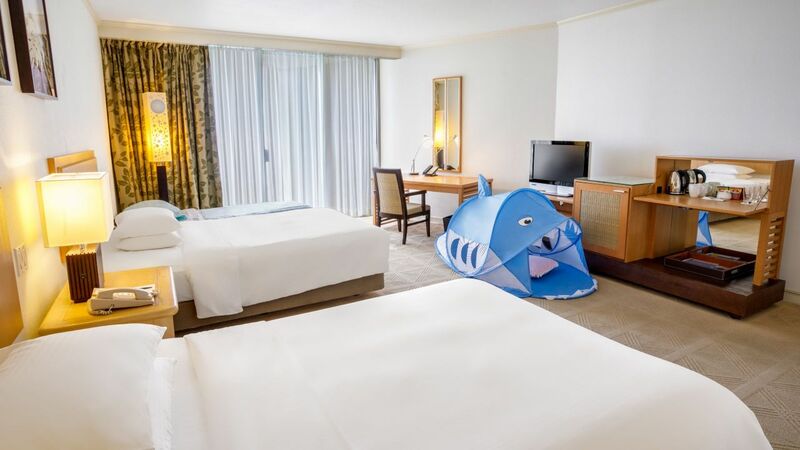 Your family will appreciate this spacious 97-sq.-metre suite featuring a separate sitting area, two plush double beds with fluffy white duvet, a single bed with fun children’s bedding, glow-in-the-dark lamp, dedicated play area, baby bathroom amenities (upon request), playful décor as well as cookies and milk upon arrival. The family touches are complemented by deluxe amenities that include complimentary welcome amenity, newspaper (upon request) and Regency Club lounge offering private concierge, breakfast, evening canapés and complimentary Internet access. See World of Hyatt program terms for upgrade eligibility. 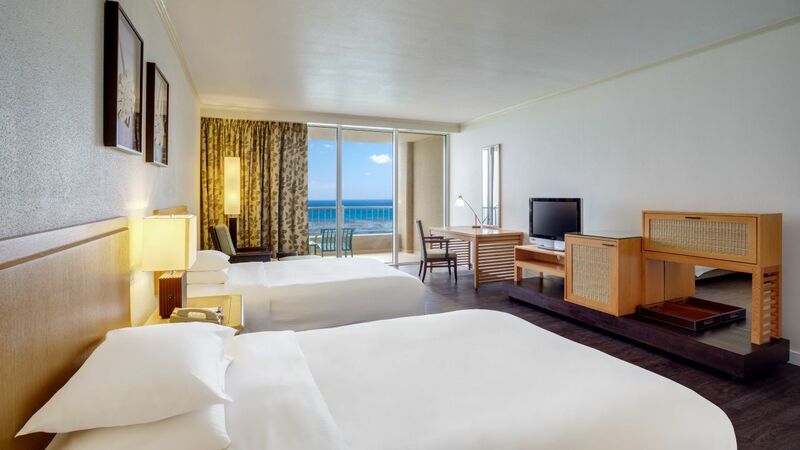 Large windows offer breathtaking ocean, pool and garden views in a 44-sq.-metre room featuring crisp, airy decor complementing plush king bed with fluffy white duvet, separate work area with complimentary Internet access and elegant bath with separate shower and tub with ocean views. Deluxe features include soft robe and slippers, spacious balcony and walk-in closet. 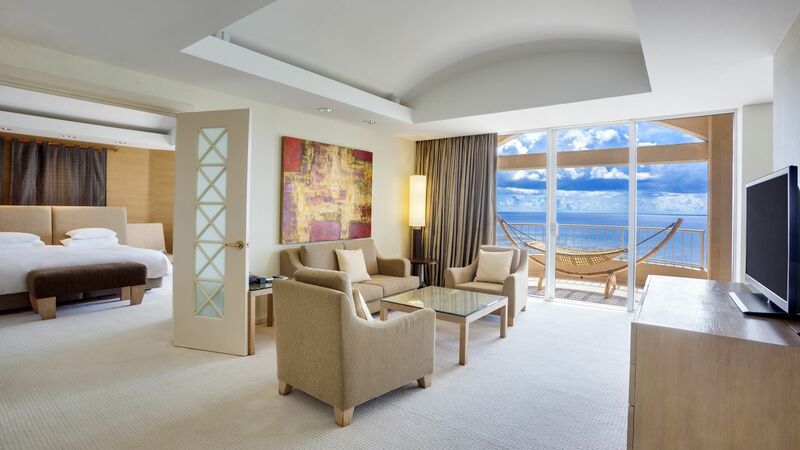 Large windows offer breathtaking ocean, pool and garden views in a 44-sq.-metre room featuring crisp, airy decor complementing two plush double beds with fluffy white duvets, separate work area with available high-speed Internet and elegant bath with separate shower and tub with ocean views. Deluxe amenities include soft robe and slippers, spacious balcony and walk-in closet. On upper floors of the hotel, enjoy sweeping ocean views from a spacious balcony adjacent to a 44-sq.-metre room featuring plush king bed with fluffy white duvet, work area with available high-speed Internet and elegant bath with separate shower and tub, also with ocean view. 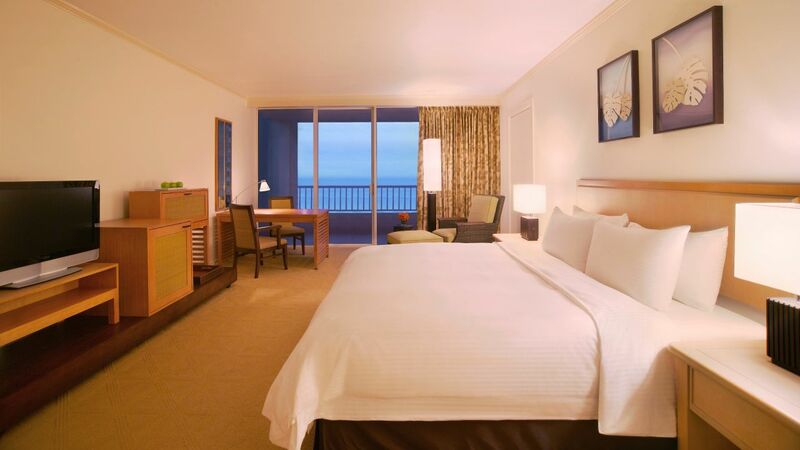 Deluxe touches include soft bathrobes and slippers, stereo system with satellite radio and crisp, tropical decor. 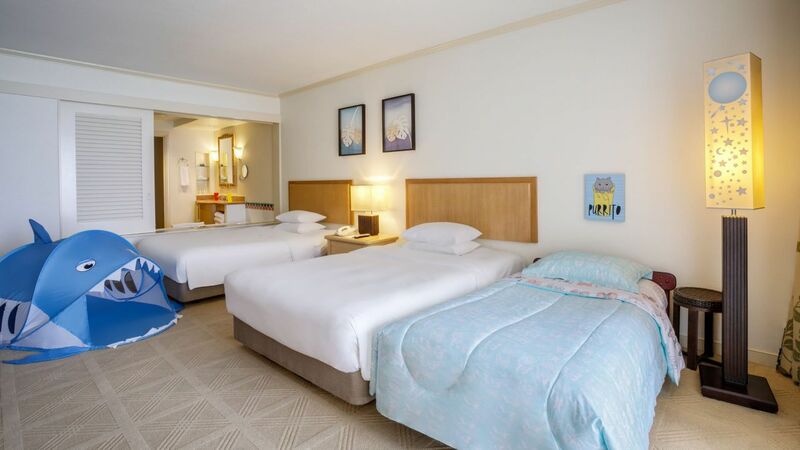 On upper floors of the hotel, enjoy sweeping ocean views from a spacious balcony adjacent to a 44-sq.-metre room featuring two double beds with fluffy white duvet, work area with available high-speed Internet and elegant bath with separate shower and tub, also with ocean view. Deluxe touches include soft bathrobes and slippers, stereo system with satellite radio and crisp, tropical decor. 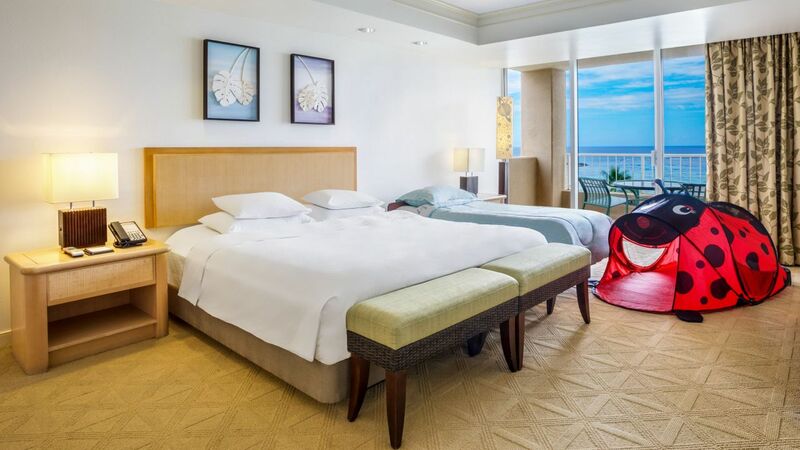 Fresh, tropical decor complements VIP accommodations including plush king bed, spacious balcony, separate work area and elegant bath with shower and tub offering sweeping ocean views. Exclusive amenities include complimentary welcome amenity, private Regency Club lounge with Continental breakfast and evening canapés, personal concierge and complimentary Internet. 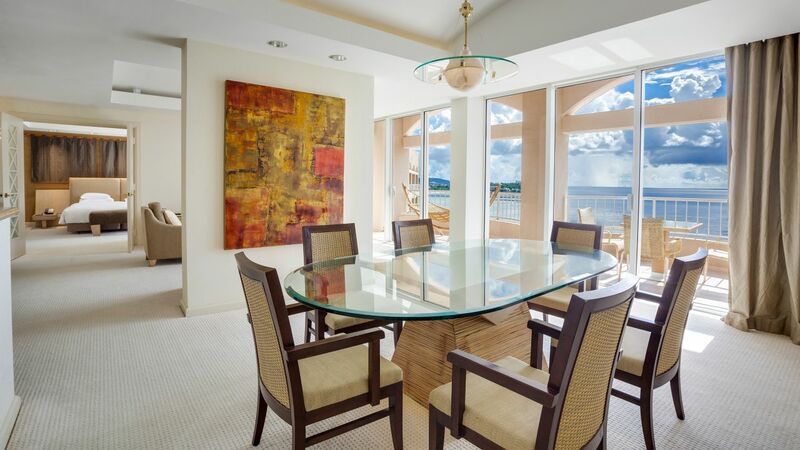 Fresh, tropical decor complements VIP accommodations including two plush double beds, spacious balcony, separate work area and elegant bath with shower and tub offering sweeping ocean views. Exclusive amenities include complimentary welcome amenity, private Regency Club lounge with Continental breakfast and evening canapés, personal concierge and complimentary Internet. Your family will appreciate the breathtaking ocean views from the balcony adjacent to a 71-sq.-metre room featuring two double beds with fluffy white duvet, a single bed with fun children’s bedding, glow-in-the-dark lamp, dedicated play area, baby bathroom amenities (upon request), playful décor as well as cookies and milk upon arrival. 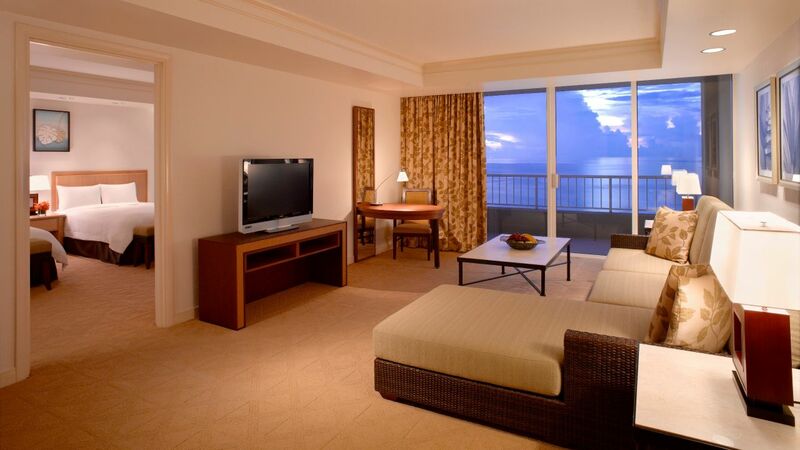 Your family will appreciate the breathtaking ocean views from the balcony adjacent to a 71-sq.-metre room featuring plush king bed with fluffy white duvet, a single bed with fun children’s bedding, glow-in-the-dark lamp, dedicated play area, baby bath amenities (upon request), playful décor as well as cookies and milk upon arrival. On upper floors of the hotel, your family will enjoy sweeping ocean views from the balcony which is adjacent to a 71-sq.-metre room featuring two double beds with fluffy white duvet, a single bed with fun children’s bedding, glow-in-the-dark lamp, dedicated play area, baby bathroom amenities (upon request), playful décor as well as cookies and milk upon arrival. 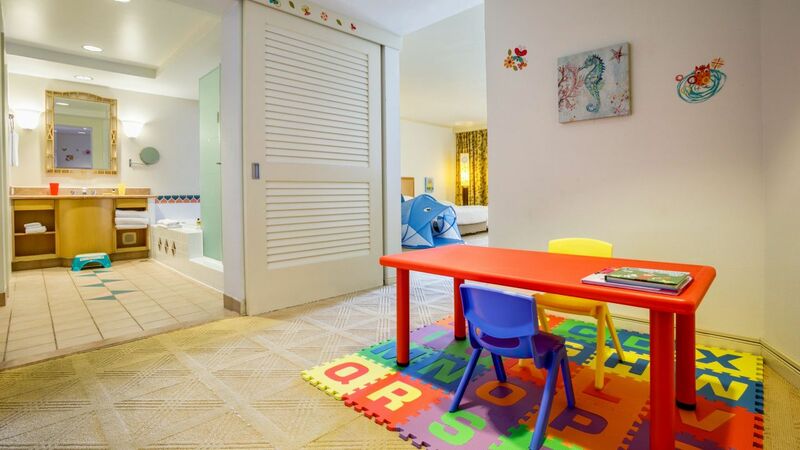 Soak up the panoramic views of the beachfront and ocean from the balcony as this 71-sq.-metre room features two double beds with fluffy white duvet, a single bed with fun children’s bedding, glow-in-the-dark lamp, dedicated play area, baby bathroom amenities (upon request), playful décor as well as cookies and milk upon arrival. For added ease, your family will enjoy access to the Regency Club lounge, offering private concierge, breakfast, evening canapés and complimentary Internet access.